Welcome to the second post of my new series all about Base. If you haven't already take a read of last weeks post featuring BellaPierre Mineral foundation . I have been threatening this post for so long as it's one I've searched many times myself. I am a long time user of Estée Lauder Double Wear it's my go to foundation if I want something that goes on covers everything and stays on, but I could never shake the feeling that I absolutely needed to try Double Wear Light to see what it was all about. These foundations are not exactly budget offerings and so I did search a bit before buying and so it's only right that I pass on my thoughts on them so somebody else can search for it. This will be a different type of review from me as I totally adore double wear and always go back to it so this isn't really about if I like the product or not it's more about me showing the differences so you can make a choice between them. Double Wear has glass bottle packaging while Double Wear Light is plastic squeeze tube. Double Wear is full full coverage while Double Wear light is medium to full coverage. Double Wear has a much larger shade range than Double Wear Light. Double Wear does last longer than Double Wear Light but the light version lasts a full working day anyway. Double Wear is much more fluid than the light version which is a creamier texture. Double Wear can be a little drying while the light version is a lot more hydrating. Double Wear gives a matt finish while the light version is dewy , I have never had to powder double Wear but definitely need a powder with light. I like double Wear for a special occasion or a night out but I prefer the light version for daytime Wear as doing what it says on the tin it's lighter and more comfortable for everyday Wear. 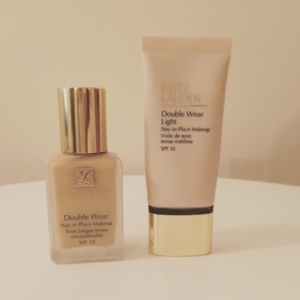 Double Wear is good value for money it lasts ages for its €44 I've gotten up to a year from a bottle, double Wear Light on the other hand about €40 dosnt seem to stretch as far I use much more of the product and get only about 2.5/3 months from it, to be fair on its own for daily Wear that's not actually bad but for comparison with the original it's not wonderful. I really like both but in conclusion it's definitely the original Double Wear that wins out for me , I'm unsure if I will ever repurchase the double Wear Light as even though it's good I have used other daytime foundations of the same quality without the €40 price tag. Use your money instead to buy the original Double Wear you won't be disappointed and I'd be surprised if you weren't converted after using it! Wet n Wild 1 step wonder gel polish.